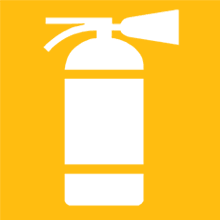 Abbey Fire Protection is an independent fire protection company with over 25 years experience in providing cost effective high quality products and extinguisher service throughout the United Kingdom. Abbey Fire Protection has built a reputation for providing its customers with experienced engineers servicing and maintaining fire extinguishers to the highest standards. All work is in accordance with BS 5306 Part 3 -2009. We have earned the continued confidence of architects, engineers, business owners and contractors in virtually every industrial and commercial market sector as well as tailored service to the private homeowner. Whatever your fire protection requirements, whether you want new extinguishers installed or existing ones serviced and repaired, the experts at Abbey Fire Protection can advise you on the most appropriate fire protection products and systems. To find out more about all our services call us on 01793 726 818 or email us to get more information from one of our qualified fire safety experts. It has always been our goal to fulfill the needs of our customers and to assist the in the control of all aspects of fire safety in the workplace. Our comprehensively equipped mobile fleet of qualified service engineers perform on site maintenance for all your fire safety requirements.